Surrounded by tranquility, this luxury, non-smoking 1800 sq.ft.townhome, in the heart of Estes Park is minutes from Rocky Mountain National Park. Gaze at the Continental Divide and Long's Peak (one of the highest peaks in Colorado) as you barbecue off the deck or just relax and allow the 'Mountain' motif to sweep you away - into the Vacation Zone! Only 5 minutes walking distance into downtown Estes Park, and a 5-minute traffic-free drive to the Black Canyon Inn or the Stanley Hotel! We're also just across the street from one of the stops for two different lines of the free shuttle service (available in the summer months). The Main Level Master bedroom has a king-sized memory foam bed, separate deck access, double vanity master bath plus a jacuzzi tub, and separate TV. Spacious family room including TV, kitchen with breakfast bar, refrigerator, dishwasher, electric range/oven, microwave, dining area, and laundry room (washer & dryer available to use) plus a half bath. The lower level has two additional bedrooms with queen-sized beds, both bedrooms have private entrances from the outside patio, one full jack & jill bath, and game room/rec room, including pool table, couches with queen-sized sleeper-sofa (memory foam mattress), and TV. Your stay includes free wireless high-speed internet access. See our comments in the guest book at the bottom of the page, we strive for happy guests! Nick and Kathy, living in the Denver area. This map drills down to the approximate location of our condo, just zoom in and we're in the center area. Thanks for considering our property, we appreciate it. My wife and I love visiting Estes Park, so we purchased this home from someone who also rented it out, and she did a wonderful job of decorating and furnishing it. Fortunately for us, she handed over the reigns, and we've been enjoying renting it out since then. We've made sure every little detail is exactly how we like it when we stay there, so hopefully it will be exactly how you like it as well! This property is ideal for families that like to enjoy the Estes Park downtown area, as you don't have to deal with traffic! You can walk to town or drive to the park without ever having to drive in the congested areas. Also, and hopefully you can sense this from the video, it's in a very quiet neighborhood, and you'll really enjoy sitting on the deck and looking at the mountain view! A very easy 5-minute walk to the center of the shopping area. There is a wonderful view of Longs Peak from our deck. We stream, and offer PlayStation Vue (local channels and the cable basics). If you have accounts to any other apps (i.e. Netflix, Amazon Prime) you can log in with your accounts. The master bedroom, living room, kitchen, and a half-bathroom with the washer/dryer are all on the main floor, on the same level as the garage and front door as well. We loved it , we wished we had more time there. Thank you so much. We would love to stay there again for more than 1 night. Perfect place for a long weekend. Wonderful property with everything you need for an awesome stay in Estes Park. Great time with family and friends. Clean, great size, close to everything! This house was the perfect size for a weekend getaway. It's extremely close to main street and to RMNP. The neighborhood was quiet and comfortable. The house was stocked with everything we could have asked for. Highly recommend this place! We enjoyed our stay! We were celebrating a couple of birthdays! Favorite things: internet access, great view, very clean, everything we needed was in the kitchen, 3 bathrooms, garage, happy family time!! We had a bit of trouble regulating heat. Too warm upstairs and too cold downstairs. That is our only complaint! As somewhat locals, we have stayed in many(!) homes in and around Estes Park, and this was one of the good ones. 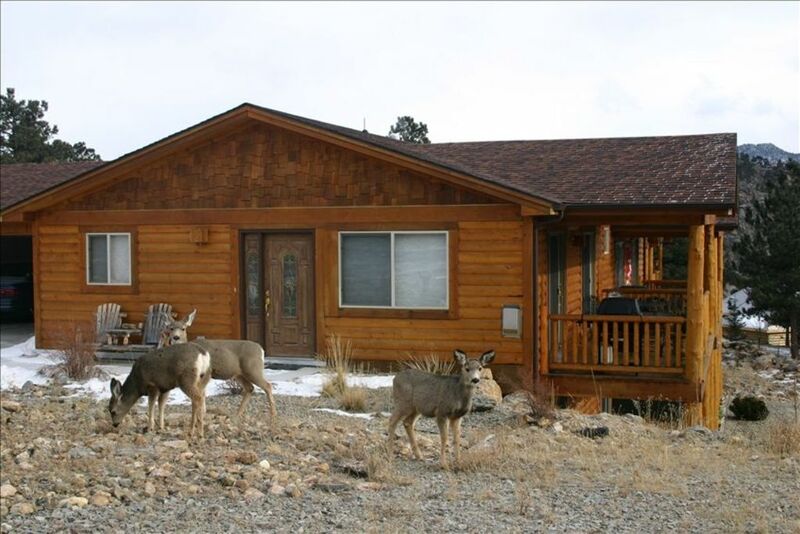 This vacation home was very nice with beautiful furnishings and even a few elk feeding in the front entryway. My wife and daughters were very pleased with the rental, and we plan on returning when it is available. We're just a third of a mile from the center of Estes Park, close enough to walk and avoid the summer traffic, but far enough away that it's peaceful and quiet. We're also just a 5-minute drive to the national park, the historic Stanley Hotel (from The Shining movie), and the lake.